Two steps forward, one step back. It’s a dance that marijuana supporters should get used to. 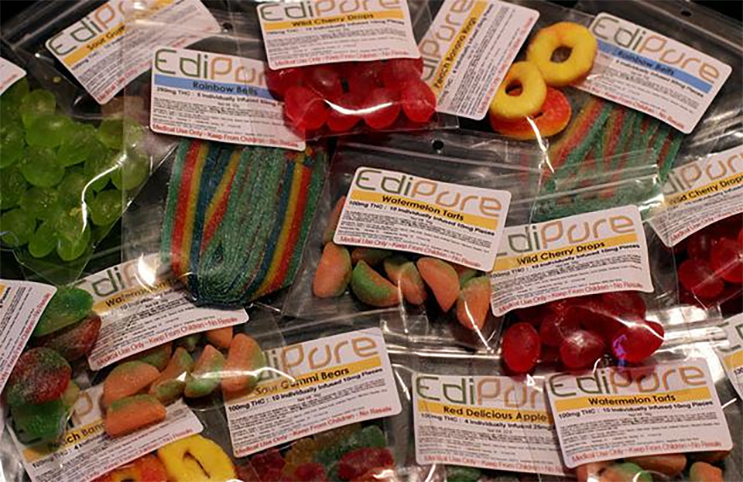 While recreational pot is about to become legal in California some lawmakers are opposed to edible cannabis that looks like candy, because it can be attractive and misleading to children. And now there’s a good chance marijuana users are about to lose out on one of their favorite ways to consume. On Thursday of last week, a little-known bill called Assembly Bill 350 passed final legislative approval and was sent to Governor Jerry Brown for consideration. The bill, introduced by Assemblyman Rudy Salas (who is, surprisingly, a democrat from Bakersfield) would stop California companies from selling marijuana edibles made in the shape of a person, animal, insect, or fruit. While some in California always had their sites on restricting ways to consume, the situation came to a boiling point when a group of middle school in San Diego became sick when they ate pot-laced gummies that other students gave them. The incident, which occurred in April in a suburb of San Diego, propelled the issue and brought lawmakers to author and introduce AB350. Other situations have occurred across the state as well. A particularly disturbing event occurred when 19 party-goers were hospitalized after they consumed marijuana edibles at a Quinceanera in San Francisco. The patients all suffered from suffered rapid heart rate, dilated pupils, high blood pressure, dizziness, lethargy, confusion and nausea. The most disturbing fact was that 13 of the 19 patients ranged in age from 6 to 18 years old. Other similar reported occurrences in Colorado have unfolded, further feeding the frenzy. Even JAMA – the Journal of the American Medical Association – published a report citing evidence that underage marijuana poisoning cases in children have increased in Colorado since legalization. Findings indicated a five-fold increase in the number of children under 10 who were exposed to marijuana, from nine cases in 2009 to 47 cases in 2015. The poison center saw an average increase of 34 percent, while there was an average increase of 19 percent for the rest of the country. According to the study, edibles were implicated in over half of the exposures, which included baked goods, candy, and popcorn products. California’s Assembly Bill 350 actually just follows in the footsteps of bill that went into effect in Colorado in July of 2016. That bill, signed into law by Governor John Hickenlooper, outlawed marijuana gummies along with any marijuana edible in the shape of animals, fruit, or people. Now that it appears we are on track to see the two largest, most established, and most influential marijuana markets outlaw these types of edibles we need to be asking a few questions. Most importantly, will this ban actually protect children? Do we not still have cases of underage drinking and cigarette use, despite similar federal legislation? Does that not then imply that children be better protected by ensuring adults that consume are educated and responsible? And almost equally important, how will patients who prefer gummies be able to access their preferred form of medicine? How will the industry be affected? Vast resources have gone into capital expenditures for business to develop their edibles lines – and many brands and ancillary business rely on edibles also. What will this mean nationally? Will legislators from other states feel the need to push for similar legislation? Will we eventually see this turn into a federal bill once federal prohibition has ended? Have the people who support this bill even tried edibles??? The passing of California’s AB350 will more than likely come to down Jerry Brown’s signature. While he did sign a proposal this year that will allow marijuana companies to apply for multiple licenses to grow, manufacture, distribute, and sell their products, he also said in 2016 that personally opposed the legalization of marijuana. If you like edibles and live in California you should start stock-piling now. And everyone from Arizona to Massachusetts will have to keep a watchful eye on their own stashes of edibles.